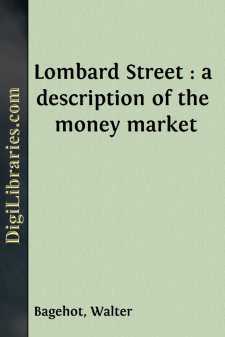 I venture to call this Essay 'Lombard Street,' and not the 'Money Market,' or any such phrase, because I wish to deal, and to show that I mean to deal, with concrete realities. A notion prevails that the Money Market is something so impalpable that it can only be spoken of in very abstract words, and that therefore books on it must always be exceedingly difficult. But I maintain that the Money Market is as concrete and real as anything else; that it can be described in as plain words; that it is the writer's fault if what he says is not clear. In one respect, however, I admit that I am about to take perhaps an unfair advantage. Half, and more than half, of the supposed 'difficulty' of the Money Market has arisen out of the controversies as to 'Peel's Act,' and the abstract discussions on the theory on which that act is based, or supposed to be based. But in the ensuing pages I mean to speak as little as I can of the Act of 1844; and when I do speak of it, I shall deal nearly exclusively with its experienced effects, and scarcely at all, if at all, with its refined basis.